A healthy balance between social and task-oriented activities helps teamwork. In virtual teams, e-mail texts must often carry both task-oriented and socio-emotional communication between individuals. While some theories of computer-mediated communication suggest socio-emotional exchange may not be well supported in e-mail communications, research demonstrates that individuals, nevertheless, achieve this. However, the lack of unplanned informal exchanges in virtual teams communicating by e-mail may still hinder team performance. We compared adaptations in socio-emotional content of e-mail communications in academic and commercial team writing contexts. Results suggested a task-oriented focus in the commercial team culture and an even social-task balance in the academic team culture. Our research leads us to recommend a more conversational style in professional e-mail writing. Additionally in virtual team working, we recommend encouraging face-to-face contact, allocating time specifically for social exchanges and making information about colleagues available to each other. Semi-Virtual Teams: “Semi-virtual” describes the scenario where virtual team members mostly work at a distance from each other, but occasionally have the opportunity to meet face to face. Team Writing: Team writing can involve two or more professionals working together to create a document. Team membership is not restricted to a particular contributing skill, such as writing, illustrating, administrating, and so forth. If the member is contributing towards creation of the document, they are considered a collaborator or team member. Team Culture: In this research, the team culture is described by the balance between social and task dimensions of team working. Group Cohesion/Solidarity: Group cohesion describes how socially close team members in a group are, their sense of togetherness or team spirit. Socio-Emotional Communication/Relational Messages: Expressions fulfilling a meta-communicative function of interaction, indicating how two or more people regard each other, their relationship, or themselves within the context of the relationship ( Burgoon & Hale, 1984 , p. 193). Social Dimension of Team Working: The social dimension of teams is basically concerned with the relationships, whether socio-emotional or organizational. The social dimension of team working is described by communications, activities and behaviours which are not addressed directly towards the group task goal, but rather towards relations, coordination of activities, welfare and maintenance of the team construct. 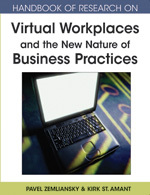 Virtual Team and Virtual Workplace: Virtual teams comprise people from related disciplines, who work from different locations, and may belong to different organizational contexts, and work at different times. The communications network supported by the Internet in this case becomes their common workplace, or virtual workplace, and is the platform through which they exchange ideas and information, and organize and progress their work.